Amy Carmichael was an Irish Christian whose faith story includes serving the poor of Belfast and the abused of India. I have loved this poem of hers—No Scar?—for more than 20 years, but I have not been able to learn the story of when she wrote it or why. If you know, I’d love it if you’d post a comment. Who has no wound nor scar? This is lovely and disturbing; I’ve never read it. I wish I knew the story, too. Will have to read more about her. Thank you for posting this, Melanie. Yes, it impacted me a long time ago, and I kept it in a file. Something made me think of it a few months ago, and I never re-filed it. It’s still just as powerful as when I first read it. I also found this impactful and did a little research. Amy Carmichael was a missionary to orphans in India. She suffered much — and bore much eternal fruit. Back in the 1920s, Amy rescued hundreds of orphaned children — especially little girls that would be dedicated to Hindu gods for use in sexual temple rituals. By God’s wonderful grace, some had miraculously escaped from such pagan slavery and were led to the Irish “mother” who lovingly cared for each child God sent her. That same day, she fell, suffering fractures that would cripple her for the rest of her life. Not one to be discouraged or bitter when faced with pain or persecution, Amy now had the opportunity to demonstrate God’s faithfulness before a much larger “host” of witnesses. While her growing children had continual freedom to enter her bedroom and share their hearts with their beloved “mother,” she now had the quiet times that allowed her to write books, poems, and letters that were translated and shared around the world. She sounds like the Mother Teresa of her day. Thanks for sharing this, Doyle. Thank you for sharing this touching poem. It certainly gives us things to think about. And thank you, too, Doyle, for sharing what you learned about Amy Carmichael. She surely was one who served in a meaningful way, although I’m sure she kept her wounds and scars close to her heart without making her suffering known. A woman to emulate, because she followed our Savior! I get the feeling from this poem that Amy Carmichael would consider each scar, each sacrifice, each disappointment a badge of honor—because they served as evidence of how closely she walked in the Savior’s footsteps! You’re right, Michelle—the Christian community is bigger than whatever church we belong to today. It includes all the saints around the world throughout history. We are not alone! And our stories become part of that tapestry, so that other people can benefit from the lessons we learn. Hello. Yes, this poem is referred to in Elizabeth Elliot’s, A CHANCE TO DIE – The Life and Legacy of Amy Carmichael; chapter 34. Elizabeth has helped us to know Amy.. Do read this. Amy’s life was LOVE, and I am encouraged by her devotion. Interesting, Billy. I am not familiar with the “swoon theory.” My sense of Amy Carmichael though, is that she did not intend to suggest that Jesus never died. I interpret her use of the word “swoon” only to convey the drama and pain Jesus experienced. It seems to me that this is in line with the main message of the poem—that as followers of Jesus, we can expect suffering and even death. 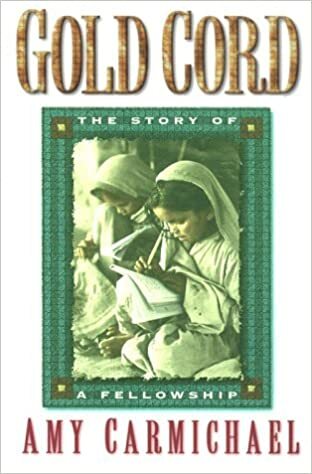 I know this thread is old, but the poem comes from Amy Carmichael’s story of Dohnavur Fellowship, “Gold Cord”, published by Christian Literature Crusade. First published in 1932. My copy was printed in 1983. It’s on p. 64. Thanks for adding this information to the conversation, Krista! Appreciate my publishing tips? I appreciate your monetary tips! There are expenses involved with running this blog, and I welcome your support in helping me cover the costs—but only if you feel I'm providing a useful service. Use the PayPal button below to make a donation of any size. (You don't need a PayPal account, just a credit card.) Thank you! © Unless otherwise indicated with proper attribution, all content in this website has been written by Melanie Jongsma. I would be flattered if you quote me, and I'd appreciate proper credit.